“3, 2, 1, we’re racing!” shouted Liz as we rumbled across the start line with a clean start to windward of the fleet. The adrenaline was rushing through my bones and as we approached the top mark with a tactical late hoist on the A3, I’m sure there was steam coming out of my ears as I wound the tack down as fast as I could during the deploy for a perfect set. The sun was shining and we had more breeze than expected as we sailed the in port section of the leg start. Brazil certainly gave us a humbling send off with boats chasing us out to sea. The fleet stayed close together and all tacked on the same shift as we worked our way up the Brazilian coast. We opted to go a little further east giving us an advantage on the rest of the fleet. When the position reports were coming in and had us faster and leading the fleet it’s fair to say there were very big happy smiles all over the boat. Finally we committed to the starboard tack reaching towards Cabo Branco, the most eastern point of Brazil and most importantly headed towards Newport on what could have been a very long starboard. With plenty of cloud activity and thunder and lightning that lit up the entire sky at night we were pushing to stay in front of the pack. As we approached Cabo Branco the fleet had compressed and our lead on the fleet had closed up. We were now hanging out with Vestas, Dongfeng and Brunel. The pressure was on to cover them and the current closer towards the Brazilian coastline was where we wanted to be. As soon as one boat went we all went in what became a gybing party. It felt a little bit like we were chasing butterflies as we fought to stay in front. Once around the eastern point of Brazil we were headed to the Caribbean dodging flying fish and plenty of seaweed. At first I thought Henry had thrown something at me but realized I had been hit on the shoulder by a flying fish. Annalise had been hit in the head and Liz managed a near miss with one as it flew towards her whilst driving. The seaweed decorated the cockpit and became the bane of our lives as we continued to clear it from the rudders and keel. We got very close to Antigua, almost close enough to stop and say hello, but no time to stop for dark and stormies on this trip as we charged on to Newport. We had decided early on to go left of the TSS and not follow the fleet that all appeared to be going right. As we approached Newport I had nightmares of the last time I was there, the fog was so thick I couldn’t see the bow of the boat as we safely navigated our way out. It was like deja vu when I realized we still couldn’t see land and the breeze quickly began to shut down. As we parked up drifting sometimes towards Newport, Akzonoble appeared out of the fog like a ghost ship. 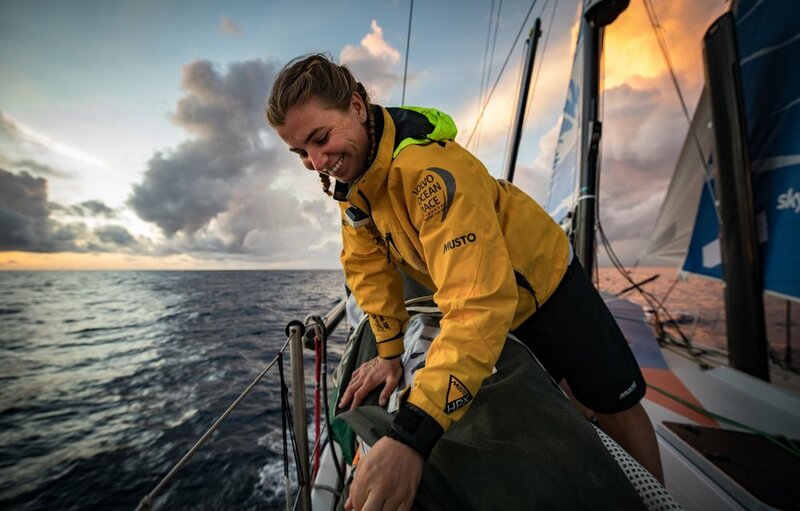 Whilst we had been painfully waiting for a shift to help accelerate us towards the finish line, that was so very close, Akzonoble had come through from behind with a little more breeze. Our hearts sunk but it was all on in a match race to the finish line where they just managed to get us. It was the most intense finish we’ve had yet and even though we didn’t get the result we were hoping for, we had just sailed over 5,000nm of one of our better legs yet and Newport gave us a very warm welcoming. So, we’ve picked ourselves up and licked our wounds and we are ready to fight hard and battle it out across the Atlantic.